Situated on the west slope of the Rocky Mountains, Gunnison, Colorado, is home to Western State College. Despite being only thirty miles from the continental divide and close to some of the best snow skiing in the world, residents of Gunnison usually start each day under clear, sunny skies. Gunnison was established in 1874 at the confluence of the Gunnison and Tomichi Rivers. Most of the land surrounding the town is under the jurisdiction of public agencies and boasts some of the most scenic hiking and biking trails in the country. At 7,703 feet elevation, the local airport has a runway nearly two miles in length, and the park ice rink doesn't require any refrigeration equipment to keep the ice fresh during the winter months. The town has a charming western feel and (thanks to all those college students), it's a great place to grab a cup of coffee before venturing out for a day of road tripping on historic US Highway 50. The road traces the path of the Gunnison River as it heads west towards Montrose. Once a mighty river with explosive corrosive power, the Gunnison's flow is now regulated by a series of dams. One benefit of these structures has been the formation of the Blue Mesa Reservoir, which, with nearly 96 miles of shoreline, is the largest lake in Colorado. In the photo, the high water mark highlighted by the bright morning sun reveals the effects of the recent prolonged drought. Although the lake has shrunk considerably, a number of enterprising farmers have made the best of things by planting and harvesting hay in some of the dried-out bays and inlets of the lake. The Gunnison today looks more like a large stream than a mighty river. As it meanders across the flat plain west of the town, it seems utterly benign. Its apparent gentleness makes the massive gorge it created all the more startling. The first indication that all is not horizontal between Gunnison and Montrose appears just downstream from Crystal Dam at the westernmost edge of the reservoir, but just as a glimpse of the canyon becomes visible from the road, US-50 heads south into a high prairie. The road passes through Cimarron and continues toward Montrose without a hint of the geological wonder only a few miles away. Then, just before the gradual descent into the farming community of Montrose (elevation 5,806 feet), County Road 347 peels off to the right and begins a slow climb up Pinon Springs Draw to a narrow mesa used for ranching operations. For about 5 miles, the road winds its way through low, juniper-studded hills, and although the vistas are sweeping, there is still no evidence that one of the most awe-inspiring gorges in the world is within shouting distance. Then suddenly, just past the park entrance kiosk, there it is. The land drops off at Tomichi Point, striking first-time visitors dumb as they gaze down at the river, which has somehow dropped 2,000 feet to the bottom of a narrow gorge whose jagged black walls contrast sharply with the chaparral above. A little further along, the Visitors Center at Gunnison Point offers exhibits explaining the geology and history of the area. 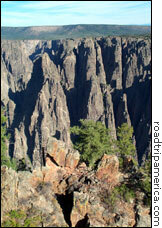 Often nicknamed the "Grand Canyon of the Colorado," The Black Canyon of the Gunnison became America's 55th national park on October 21, 1999. In a mere 48 miles, the Gunnison River loses more elevation than the Mississippi River does all the way from Minnesota to the Gulf of Mexico. The resulting canyon walls are nearly vertical. At Warner Point, for example, the gorge is 2,772 feet deep. Early explorers to the area considered the gorge impossible for human travel, and even today, the few trails that snake their way to the bottom are restricted to experienced hikers and climbers. Just outside the Visitors Center is a trail leading to a spectacular canyon overlook. Constructed on a massive but narrow "pegmatite dike" about 2,000 feet tall, the viewing area at the end of the trail is a guaranteed vertigo-inducer. Even though it's nearly half a mile below, the rush of the river's rapids and whirlpools is audible from above. Aerial photographs (see the links on the bottom of the page) show the striking character of the gorge, which in some places is less than a mile across. As the gorge runs west, the jagged black schist of Gunnison Point gives way to other textures and colors. The smoother surfaces of Painted Wall are a pinkish gold color marbled with white intrusions that look like dancing dragons. Photography is a challenge, however. Much of the canyon is in deep shadow all day. The east-west orientation means that late afternoon and sunset offer the most spectacular light. 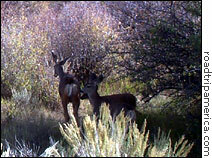 The area around Black Canyon is home to a variety of birds, and mule deer often approach the roadway to see if tourists are breaking the rules and offering handouts. Less obvious but documented by the park rangers are weasels, badgers, cougars, and black bears. For those who travel with their own animal companions, Black Canyon is one of the few national parks that permits pets on the paths to scenic points along the cliffs. Englishman John Crossley has been exploring national parks and monuments in the southwestern USA since 1993. American Southwest, his excellent Web site, provides some wonderful photos and descriptions of his explorations in these areas. Some additional photos and historical information can also be found at the official National Park Service site.